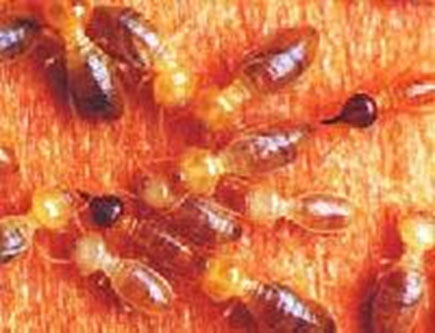 Coptotermes acinaciformis is found throughout mainland Australia and causes more damage to property than any other species. It is aggressive in its search for food and will attack many items other that wood in its search for cellulose materials. It will damage wall lining boards, electrical wiring and even personal possessions. Colonies often nest in trees or stumps but can form nests without ground contact. 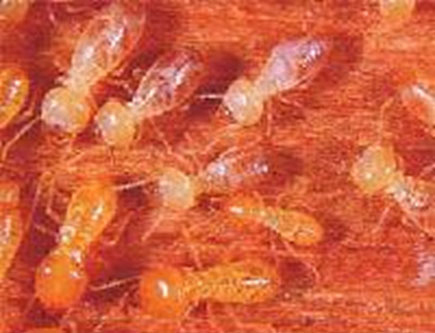 These termites can cause damage approaching the severity of that caused by Coptotermes. They build fragile nests in old tree stumps, in timber buried in the ground, in filled patios and under fireplaces. The damage they cause is distinctive. Although it can be severe it is often patchy, with huge gouges taken out of sound timber, particularly around nails in floor boards or other timbers. Schedorhinotermes colonies contain major and minor soldiers. There are several species of Nasutitermes which may damage timber in service. Soldier termites are distinguished by their pointed heads. Nasutitermes exitiosus usually builds a low mound and is more common across southern Australia. Nasutitermes walkeri builds part of its colony as an arboreal nest on the branch of a tree; the rest is constructed in the ground beneath it. This genus will mainly attack hardwood such as that found in fences, landscaping and timber decking.